As with all notice types, printed notices can be set up as your only notice type, or can be used in combination with other notice types. You can include a QR code on these notices — voters can scan the QR code with a mobile device to be taken directly to the ballot on that device. You can also customize the notice template, if you want. 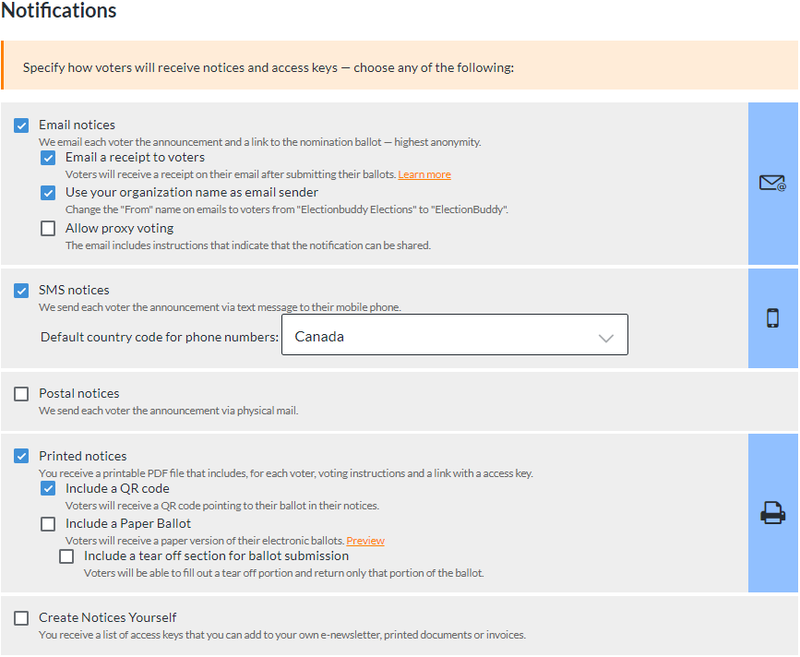 A paper ballot can be included with printed notices; see Setting Up an Election with Paper Ballots for more details. 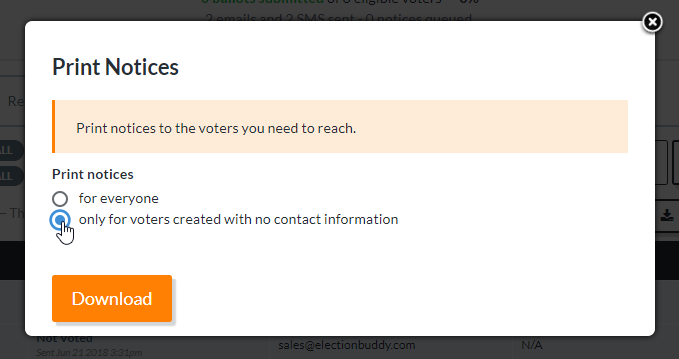 Proceed to the "Voters" tab in your election setup. 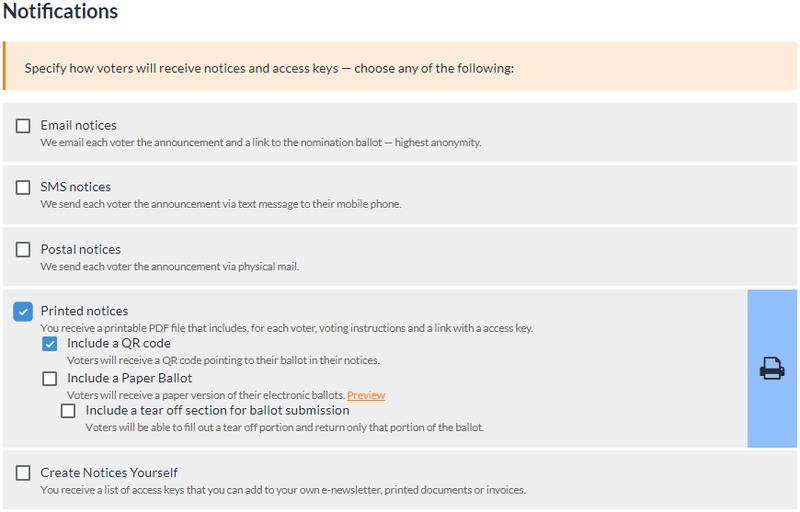 Edit your notice templates for your notice types as required, and then proceed to the "Voters" stage of your election setup. Ballot IDs "5" and "6" correspond to voters receiving printed notices, as there is no contact information for them. Locate the ballot ID that corresponds to the printed notice that you want to download in your voter list. You can do this manually, or by searching in the search bar at the top of the voter list. A new tab will open up in your web browser that contains a PDF of your voter's printed notice. You can then download and then print the notice, or you can print the notice directly from your browser. That voter's status will turn from "Available" to "Printed" in your voter list. From the drop-down list of options that appear, choose "Print Notices". If you need to distribute physical voting material to your voters, in addition to any electronic notifications they receive, choose "for everyone". However, if they have contact information, please note that this information cannot be updated once their notice is printed. To print notices for your voters without contact information, choose "only for voters created with no contact information". A new tab will open up in your web browser that contains a PDF of your voters' printed notices. You can download and then print the PDF, or you can print the notices directly from your browser. All voters whose notices were printed will now show their status as "Printed" in your voter list. The printed notices can be distributed by mail, or you can physically hand the notice to the voter. To vote, your voters simply need to follow the instructions in the notice.